the garden-roof coop: Book Review: A Kid's Guide to Keeping Chickens ~ and a Giveaway! Book Review: A Kid's Guide to Keeping Chickens ~ and a Giveaway! I'm so exciting to share this book! 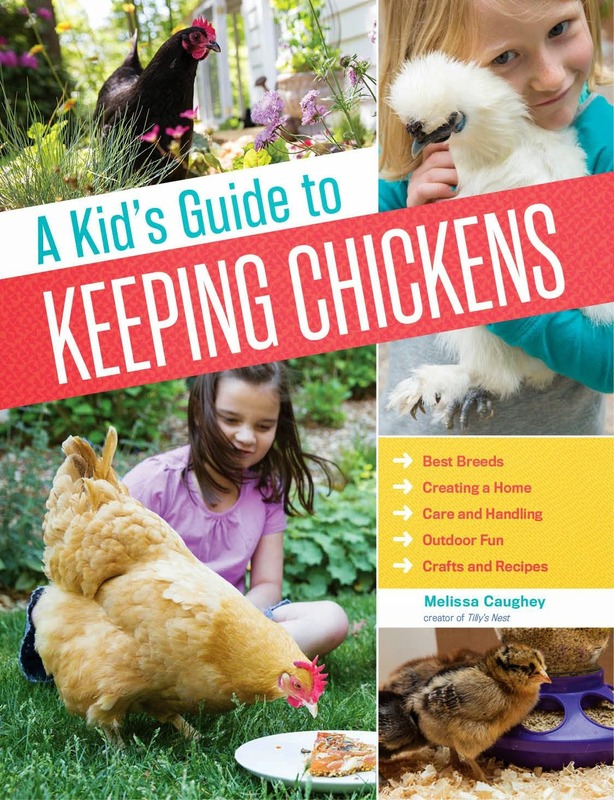 In addition to her blog, Melissa contributes to HGTV Gardens, Community Chickens, Grit Magazine and Country Living Magazine - and now she has written a wonderful book, A Kid's Guide to Keeping Chickens (Storey Publishing). 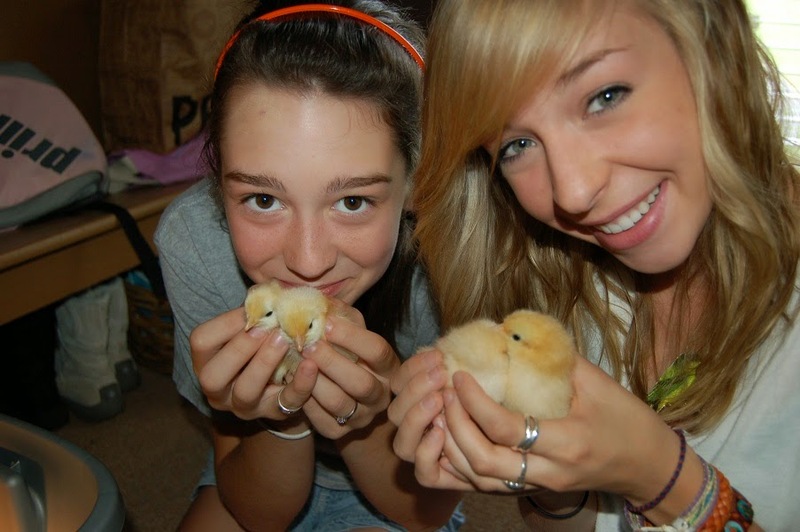 When my family undertook our first flock of day old chicks, I had no idea what an impact it would make on our daughters. Raising and growing your own food is such a good example to children (actually anyone) on not only where your food comes from, but also how important it is to humanely treat and respect the animals that provide our nourishment. 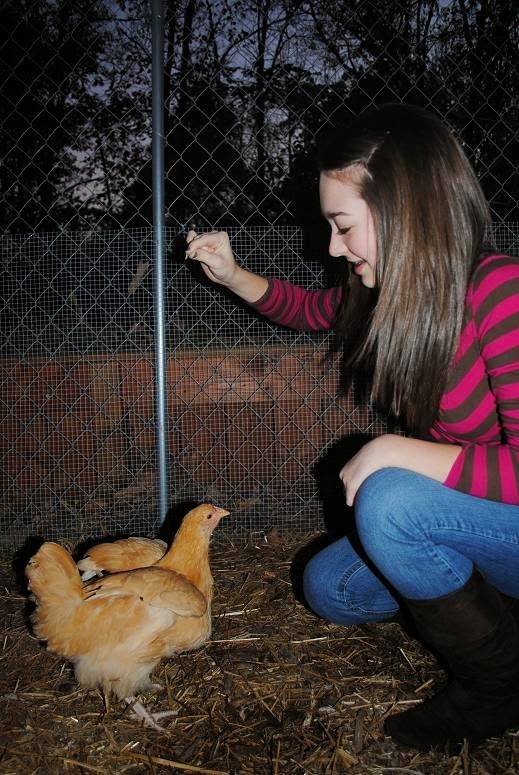 It includes the basics of chicken keeping: the set-up, choosing a breed, how to care for chicks and the flock. There are several DIY projects, crafts, recipes. The layout, photos, illustrations and articles are eye catching, creative and easy to read. - Kids of any age will love this book. The interviews with children got me pondering on how my own daughters, Lydia and Grace, would respond to the list of questions. - Here's a few highlights of my own interview with them. 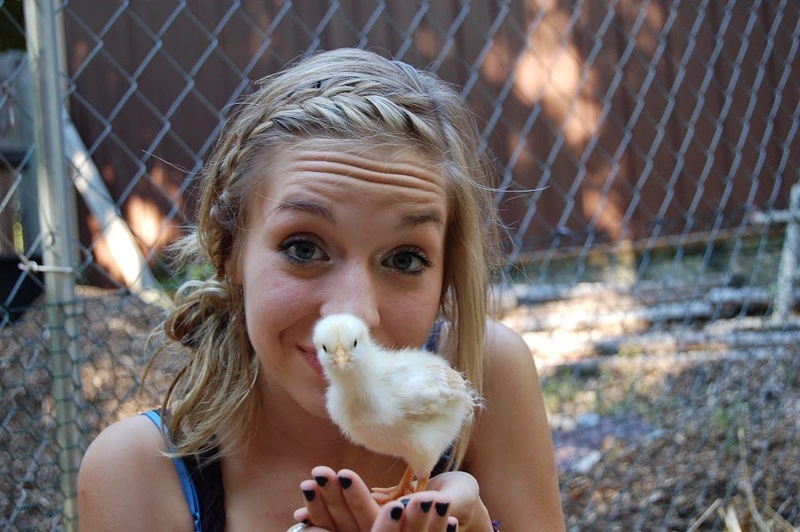 What do you love about keeping chickens? Lydia: I like how they encourage self sufficiency. - Grow your own food! Grace: Fresh eggs for breakfast and I love seeing them run around the yard! Do you have a favorite breed and why? Lydia: Buff Orpingtons - because they are so friendly, but I also love Easter Eggers and Silkies. Grace: Easter Eggers - I love the green eggs (egg shells / not the eggs)! What is your favorite thing about chickens? Lydia: I think that it is so fun that each hen has its own unique personality. Do you have any advice for other kids just getting started? Lydia: Let them free range and forage if possible. - They are so much happier and healthier if they are free to roam and explore. Grace: Play with them from the beginning as day old chicks. - They'll be much tamer when they're large hens. 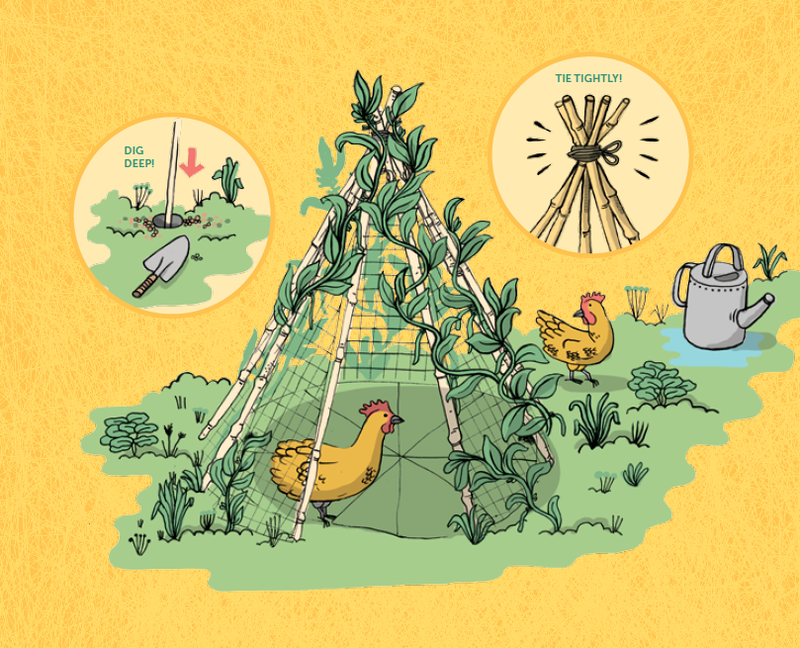 As for the DIY projects that she includes, the "Chicken Fort" is my favorite! As a gardener and mom, I can only imagine the hours of entertainment this project would provide the kids and the flock! When I give my presentations on "Gardening with Chickens" - through my local Master Gardener chapter - I always have families in the class that have so many questions on the basics of chicken keeping - and how to involve their children in the adventure. This book will definitely be recommended and added to my list of resources. Now here's the good part! Storey Publishing is conducting a blog tour promoting the release of this book. Not only did they send me a copy, they are going to send a copy to one of my readers. To enter this contest simply leave a comment below - including your email address - and in 2 weeks (March 24) I'll randomly choose a winner (US residents only). You can increase your chances of winning a book by visiting the blogs listed below. Good luck! the garden-roof coop - that's me! I invite you to follow my Facebook page to see the products available in our Etsy shop, my DIY projects and more photos of my backyard birds (including chickens!). This would be a great gift for my son! my grandkids are begging for a flock. Your book would be very helpful. Looking forward to following your pages. I know a little boy who loves all things chickens. This book would be a great companion for his chicken experience! Thanks! What a cool idea! My kids love diy books. This chicken book would be a fabulous addition to their collection. My granddaughter would love to have this book. She has been helping with my(our) chickens and the knowledge that she has retained is remarkable. She has been helping with the chickens since practically birth. I know your book has more knowledge than either one of us has and this would really help her in many ways I would love to win this book and be able to give it to my granddaughter. Thank you for the wonderful opportunity to win this giveaway. My daughter Lydia would love this book! How exciting!!! I hope I win as I am eager to introduce chickens to our life! I don't keep chickens, but it looks like so much fun! If I was a little younger and had a little more time, I think I would do it. Sounds like a great book! I have this book and love it, would love to win another copy for a homeschooling friend. This would be so fun to go through with my son! I appreciated you interviewing your own daughters! Would love to win a copy! p.s. snow pumpkin at gmail dot com (no spaces of course). It's also on my profile, I'm *not* a no-reply blogger! Would love to have this for my 2 daughters!! Thanks for the great giveaway. Would love this book for my four year old! Congratulations Kim! You're the winner! This looks like a fun book to have in by chicken library. This contest has ended and a winner has been chosen. Thanks for all the comments. - Be sure to follow Tilly's Nest (blog and facebook) for more updates on her flock and book!